Volume 2, Book 1, Chapters 16 (1992) was written by Joseph E. Schwartzberg and is devoted to “Cosmographical Mapping” in South Asia. The artifacts described include a pair of large cosmographic paintings that are displayed in the Meenakshi Hindu temple in Madurai (Tamil Nadu, India): fifty years old copies of ancient, possibly XVI Century, originals. The first painting is a circular world map (Bhugolam). The second, which is discussed in this page, illustrates the celestial dome (Khagolam) and is reproduced in the volume (Fig.16.19). 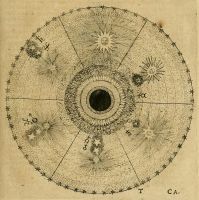 According to “The Hindu” newspaper, the two original cosmological paintings and their modern copies were restored in 2008, but it was not possible to find better images of the diagrams or any kind of additional information on the subject. 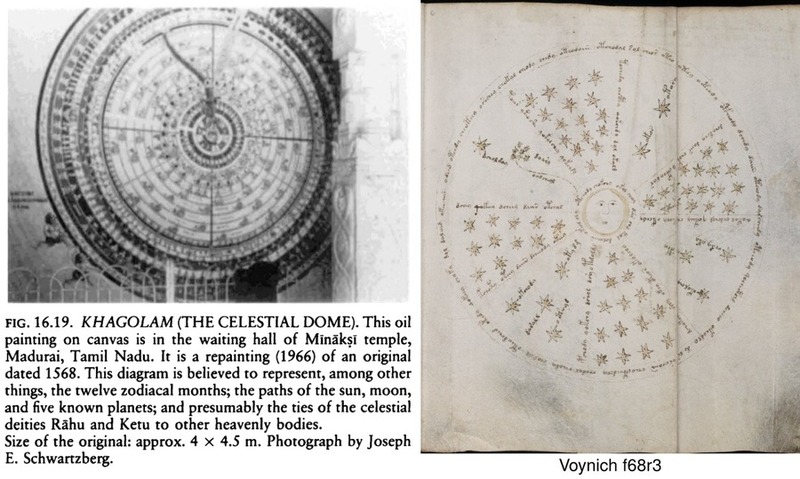 The painting illustrating the celestial dome presents some aspects that can be compared with Voynich diagram f68r3. 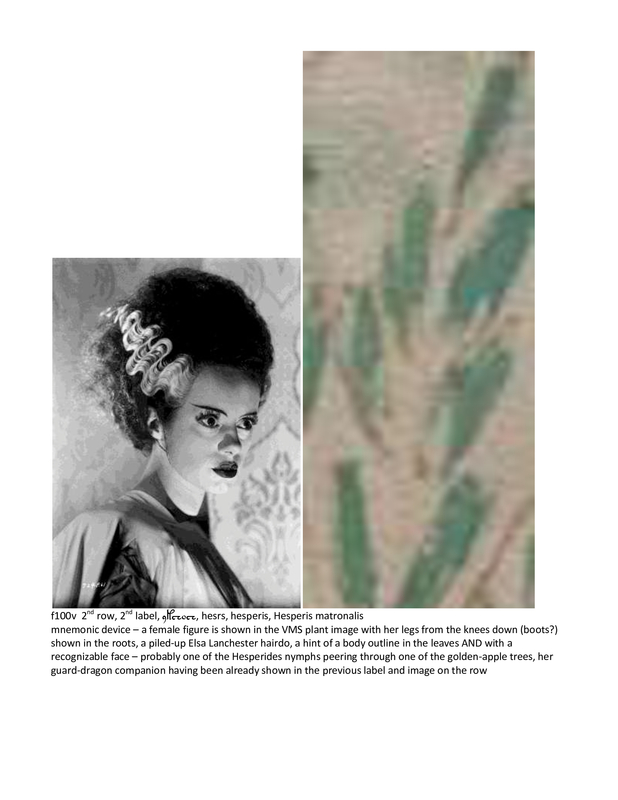 This parallel should be considered with caution for several reasons including the fact that the date and place of origin of the Madurai painting are far from those of the Voynich manuscript. Schwartzberg admits to be “unable to interpret this painting with confidence,” but his analysis seems to be careful and, in many respects, straightforward. 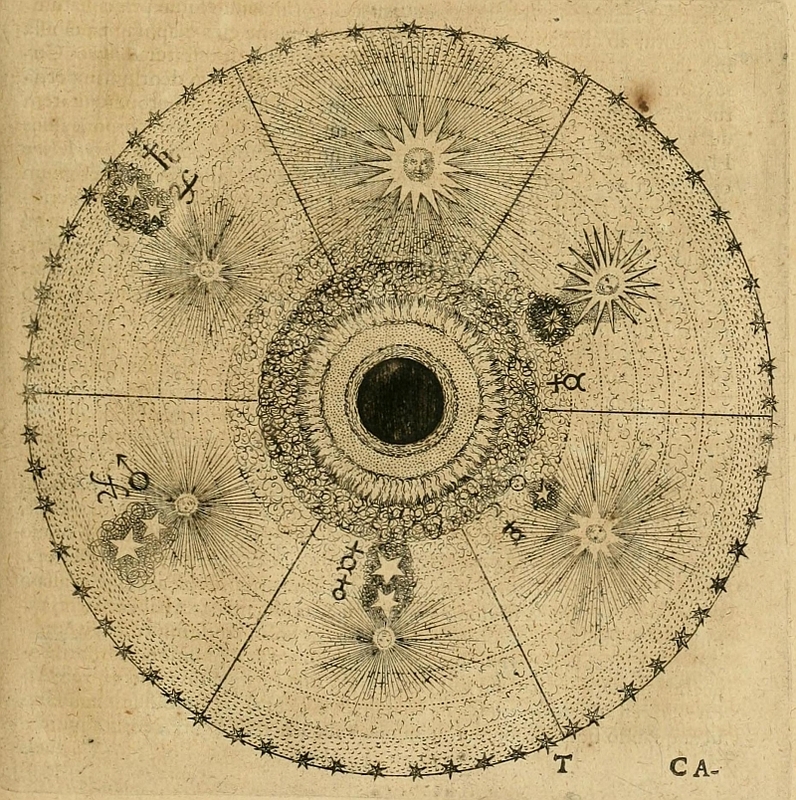 Even if the quality of the picture in the PDF version is low, the author provides a number of additional details: “it seems safe to assume that the male and female figures seated in the center of the painting represent the sun and the moon, respectively, and that the wheels for the planets occupy the relatively light space between the more central and more peripheral groups of concentric rings. Radiating outward from the center of the diagram are twelve spokes that may be described as like hour divisions of a clock. Presumably these are the divisions between the twelve zodiacal months. … The snakelike figure extending upward from the center and somewhat to the left to just beyond the outermost planetary ring I take to be Rahu, the causer of eclipses. Its open jaws appear about to swallow up the sun and the moon. Also extending upward from the center, through the light field of nine encompassing rings and slightly to the right, is a thick band that looks like a river, which perhaps represents Ketu. Rahu’s tail is tethered by seven (count not certain) fine lines (not discernible on the photograph), connected to various wheels (grahas? [i.e. the planets]). All but one of these lines terminate in the upper half of the painting. … A final feature of note in this exceedingly complex cosmography is a gold pavilion at the very top of the wheel, possibly the abode from which Brahma observes his creation and regulates the mechanics of the entire cosmos”. The identification of the “snakelike figure” with the eclipse dragon seems reliable, in particular because the monster appears to be devouring the sun and the moon. In Assyrian sources, the eclipses are attributed to seven demons, that included a snake and a dragon (The Eclipse Dragon on an Arabic Frontispiece-Miniature, G. Azarpay, 1978). When the astronomical nature of the phenomenon was understood, the lunar nodes (i.e. the points in which the orbit of the moon intersects the ecliptic) were identified with the head and the tail of the imaginary dragon. In Indian culture, the head and tail of the eclipse dragon (Rahu and Ketu) were assimilated to the the real seven planets, bringing the total number of the planets to nine (the Navagraha). With respect to Schwartzberg’s analysis, it can be observed that the “thick band that looks like a river” is unlikely to represent Ketu (the descending lunar node), since the head and the tail of dragon are always separated by exactly six zodiac sign (i.e. they are at opposite points of the ecliptic) but the distance between the “river” and the “snake” is only about 45 degrees. This band could possibly correspond to the Milky Way. the other extremity of the line, towards the outer circumference, is linked with several celestial objects (in the case of the Madurai painting, the exact number is uncertain, but they could be seven in both illustrations). additional personifications appear outside the outer circle: possibly Brahma at the top; the two figures visible at the bottom left of the picture could be spirits spinning the celestial wheels. The possibility of a link between Voynichese and Indian languages has been discussed several times on this blog (for instance in Stephen’s discussion about the place where the manuscript was produced). Also the identification of the curved line in f8r3 with the eclipse dragon has been discussed on this site: in the Persian tradition the dragon was known as Gochihr or Gozihr, a name derived from an earlier form “gao-čithra” or “gau-čithra”. The Arabic names “al-jawzahar” / “al-gauzahar” derive from the Persian. The Arabic name was sometimes Latinized as “geuzahar” or “geuzaar”, but typically, in Latin sources, the Lunar nodes were just called caput and cauda draconis (the head and tail of the dragon). According to the phonetic system developed by Derek Vogt as an extension of Stephen’s research, the label near the curved line EVA:oalcheol reads “awshõas”. Derek judges significant the agreement between the Arabic and Persian names and his phonetic reading. In most ancient sources, the eclipse dragon is represented as a dragon or snake (as in the Madurai celestial dome), not as an abstract curved line as that appearing in f68r3. The cluster of seven stars has often been identified with the Pleiades and the label EVA:doary with the Latin name of the Taurus constellation (as proposed by Rene Zandbergen and other researchers, including Stephen in his 2014 paper in which also the Arabic form “thaur” is discussed). This identification allows a direct phonetic mapping for the Voynichese label. It would be interesting to know the orientation of the Madurai diagram: is the dragon represented in the area corresponding to Taurus? Unluckily, Schwartzberg’s discussion is too brief to cover this level of detail. The parallel between the Madurai painting and f68r3 could suggest an alternative interpretation of the seven stars labeled EVA:doary: they could represent the seven planets, or five planets (Mercury, Mars, Jupiter, Venus, Saturn) and the two lunar nodes. An association of the eclipse dragon with the planets is also stated in Zoroastrian texts that (differently from most Western traditions) present all the planets, with the exception of the Sun and the Moon, as evil (Zoroastrian Astrology in the Bundahisn, Mac Kenzie, 1964). The identification of the cluster of stars in f68r3 with the planets has been independently proposed by some researchers, see for instance this post by user “VoynichViews” on the Voynich Ninja forum or this recent post by Elmar Vogt. As far as I can tell, EVA:doary does not seem to be linked with a word designating the planets in any of the major languages that have been considered (Latin, Greek, Persian, Arabic, Sanskrit), but possibly further research might suggest viable candidates. Along with the possible interpretations of the seven stars as the Pleiades or the planets, it is worth mentioning a third possibility, unrelated with the Madurai painting: the seven brighter stars of Ursa Major (the Big Dipper) are often taken as a symbol of the North. As discussed in the forum thread mentioned above, the Latin Septenptrio for North originally meant “seven oxen” referring to those seven stars. Also in the Zoroastrian tradition, Ursa Major had a prominent role and a name derived from the numeral seven (Haftorang). 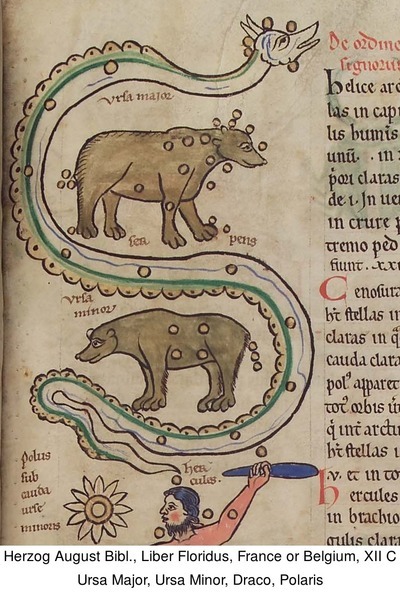 A Spanish manuscript in which one of Ursa Major or Ursa Minor is used a symbol of the North has been previously discussed on this site. The top-left sector of the f68r3 diagram could correspond to the cardinal direction North, and the “curved line” could possibly be interpreted as the Draco constellation, which is also close to the Northern celestial pole. See for instance how Draco is represented at the center of a sketch by Thomas Betson, 1500 ca, which has also been previously discussed on this site. Of course, in most ancient illustrations, the Draco constellation (like the eclipse dragon) is represented as a reptile. 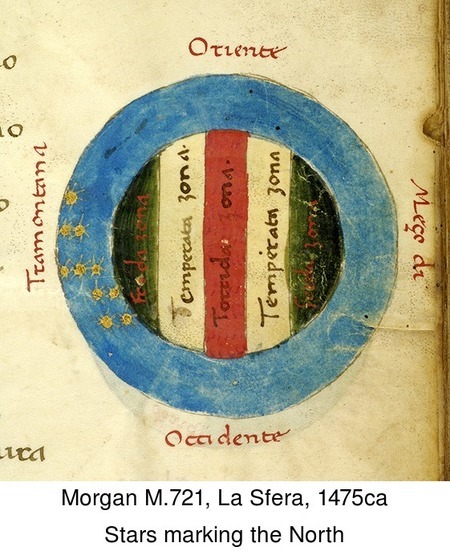 Under this interpretation, the label of the star cluster could denote the Big Dipper constellation or simply the North (as “Tramontana” in the Italian ms Morgan M.721, which features a ten stars constellation). It should be noted that the arrangement of the seven stars in f68r3 is different from the actual shape of Ursa Major. The way you’ve phrased this may be unintentionally misleading but I thought you should know that as a rule the “The Arabic names “al-jawzahar” / “al-gauzahar” etc. refers to Orion and/or Gemini. I agree that the etymology is obscure, but I’m surprised to learn that it is supposed Persian. Can you cite your source for that (it’s ok; I have the usual sources for this sort of thing – Neugebauer, Ibn Majid, David King, Sergeant and so forth so I can look it up). Have you any thoughts on why it should have been ‘mentioned numberless times’ since… what … 1931.. without anything more solid coming out of those ‘mentions’.? Are you saying that Panofsky argued some influence from that work? If so, could you direct me to where he said or wrote it? I’d like to read his original comment. Apart from the ‘mention’ has anyone actually written a formal paper explaining why they believe the evidence permits such an argument? Or is lack of any concerted study by the ‘serious scholars’ the chief reason for the notion’s remaining only ‘mentioned’ and oft-repeated but basically insubstantial. If there is any formal argument which has been written, reaching such a conclusion – in blog, in an article.. whatever, I’d love to read it. I probably shouldn’t say this without spending more time on close inspection of it, but at first blush that painting looks to me to be – perhaps/probably – a variation on various Chinese artefacts, one of which was the compass with a magnetised needle, but others astrological and/or magical artefacts. There’s a great deal written about them, and I’m surely not the best person to expound it. Here is the face up close. It could be that part of the manuscript is influenced by the Igigi mythology. In the mythology the Anunaki made man to build watercourses which I think we see in the manuscript. On one of the first pages is a palindrome 8a8a8 which could reference Igigi I don’t think there are many 5 letter palindromes but I could be wrong. Just a thought. Please start reading my post from the figure. Does anyone have any opinion on whether its significant that the f68r3 sectors containing labelled stars, have incremental numbers of stars. Do these star-groups represent asterisms? If so, what might they signify – divisions of the year? compass directions? my personal opinion is that the clockwise increment in the number of stars in the four sectors is significant. Unluckily, I am not aware of good parallels for this aspect of the diagram: I am just speculating. My impression is that the star-groups do not represent asterisms: they are symmetrically arranged, with one or two stars at the center of each sector and, at 4 and 7 o’clock, two more stars in mirroring positions at the left and right of the central star(s). This arrangement seems to me to suggest that the stars have been placed according to some kind of aesthetic or symbolic balance and not according to the shape of actual constellations or asterisms. But it should also be noted that the shape of asterisms was sometimes artificially simplified in ancient illustrations (e.g. the Pleiades in Harley MS 647, various constellations in the 1512 edition of Regiomontanus). 6: small Sun: Jupiter and Saturn. I don’t know how much of Fludd’s theory about the origin of the planets was derived from more ancient sources. I also don’t think that Voynich f68r3 diagram could possibly represent the same process. But, in my opinion, it could be that the four sectors in the Voynich diagram have a similar meaning, grouping in each sector celestial bodies which are similar or related with each other. Of course, this could be compatible with the sectors signifying the four seasons / compass directions. Hi Marco – My guess at a meaning for this diagram is that it indicates prominent constellations and asterisms marking each of the four seasons, as seen from the Northern Hemisphere. The sector at the 10 o’clock position contains one large labelled star and 7 smaller stars. The label probably indicates Taurus. Taurus is a large and prominent constellation of the Zodiac that is visible during winter. The opposite sector at the 4 o’clock position contains three labelled stars. This would be the three stars of the Summer Triangle (Altair, Deneb, and Vega). The following sector at the 7 o’clock position contains four labelled stars. This would represent Autumn and the four stars would represent the Square of Pegasus (Scheat, Alpheratz, Markab and Algenib). The opposite sector at the 1 o’clock position contains two labelled stars. This is somewhat problematic, as the asterisms closely associated with Spring contain either 3 stars, for the Spring Triangle (Arcturus, Spica, and Regulus) or the four stars, making up the asterism of the Great Diamond (Arcturus, Spica, Denebola, and Cor Caroli). Perhaps the author followed a different tradition for this season, perhaps due to their latitude or maybe just the two brightest stars were meaningful to them. This is further described here large seasonal asterisms. I wasn’t previously aware that the shape of asterisms was sometimes artificially simplified in ancient illustrations, so this was helpful in formulating my ideas about this diagram. Hi Marco – I find the possibility of an Indian link with the VM quite intriguing. My hesitation is how to reconcile this with the Italian/South German influence that’s been reported. However, there was quite a lot of contact between Europe and India, prior to the famous Portuguese encounter with the subcontinent in 1498, when Vasco da Gama reached Calicut on Malabar Coast. 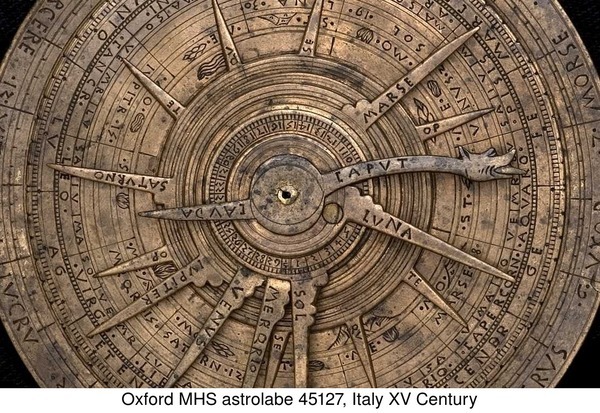 One interesting encounter is reported by Peter d’Abano (1257–1316), a 13/14th century Italian astrologer, philosopher and professor of medicine who travelled widely throughout Europe. In his book, the Consciliator, he cites a letter by John of Montecorvino. Quote: “in the coast where lies the body of the Apostle Thomas,” he alludes to to the attempt of two Genoese galleys to reach India by sea “almost 30 years ago” – two centuries before Vasco da Gama. So there seems to have been an interest and awareness of recent contact between Europe and India among 13th-century European writers. My point is that, its not too far fetched to imagine that the VM might have been based on knowledge brought back from India. * The similarity is accidental and the two illustrations are actually unrelated (this is not exactly an “explanation”, but it’s a possibility I always keep in mind). * The similarity is meaningful, but the illustrations only have a remote common ancestor: as discussed above, the idea of an eclipse dragon related with (or making part of) seven cosmic agents can be traced back to Assyrian sources. The idea (like most astronomical / astrological concepts) spread in greater of smaller detail to a wide region including both Europe and India. * Some kind of direct transmission by means of a traveler (as you discuss), a manuscript or possibly a migration like that of the Rom. * A possible variant of the previous point is that the concept was transmitted from the East to the West, but the diagram was produced in the West. I am curious about this supposed “taurus”/ thaur for EVA doary. I’m tardy to the party on this question and this has probably been discussed before, but…. 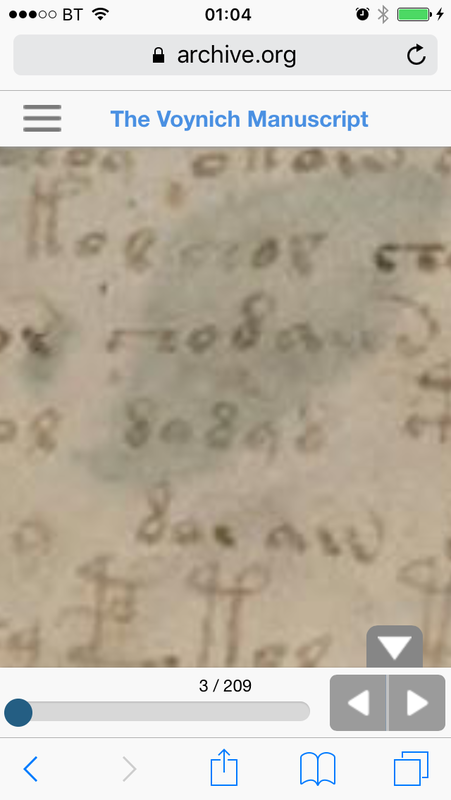 Based on the voynichese website, EVA “doar” only appears twice in the Voynich manuscript: once in the “pleiades” folio 68r3 (voynichese.com has it mistranscribed as doar when it should be doary), and a single true “doar” in 68v3. I wonder, if this “doar” is linked to Taurus, wouldn’t it be expected to appear on at least one of the Taurus zodiac pages? As far as I know, the kind of internal consistency that you suggest has never been found in the VMS. I do expect that such systematic internal correlations exist (e.g. in most astronomical / astrological manuscripts, the whole list of the twelve zodiac signs appears several times). Spelling variation, discussed by Stephen here, is a possible explanation for the difficulty of this kind of analysis. I have been thinking about the supposed “doar” at the beginning of the bottom half of the f68v3 T-O diagram. In my opinion, the first character is not readable: the word could just as well be “soar”. See also this similar unreadable initial character (in red) that has not been included in Takahashi’s transcription. 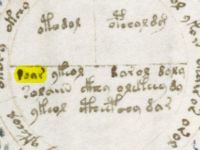 A possible doary-related word in a possible zodiac diagram could be EVA:dorar at f67r2 4 o’clock, but of course the relation between the two words is pure speculation. First let me begin by apologizing for the comments I posted on the forum this morning. I absolutely meant no disrespect to either of you. “As I recently commented on Stephen Bax’s site, if the label is Taurus shouldn’t it appear in the Taurus pages? I was told that that is not how Voynich text works. “I see that, but then he uses the same principle to claim other translations of words in the text (not labels) like Centaurea. Is the claim then that simple substitution and Latin is only used in words that contain “taur”? It seems to me that the shots get longer and longer the more we follow up on this. MarcoP is right: I should have replied here, and I see now that I profoundly misunderstood the meaning of MarcoP’ s reply above. Apologies to both of you, and I will be grateful for any comments/replies on this. thank your for your further comments! I will add a few details to what I previously wrote. It is not certain that the zodiac pages contain astrological or astrological information. Even if they are illustrated with zodiac signs, in principle these pages could be part of a calendar unrelated with the zodiac. See for instance the two April/May pages f4v and f5r in BL Add MS 36684: Taurus is prominently illustrated at the bottom of the second page, but the zodiac sign is not mentioned. This is not infrequent in manuscript calendars. 1) The parallel with the Astromagia ms by Alfonso X BAV mv Reg.Lat.1283a has been mentioned numberless times, from Panofsky onwards. 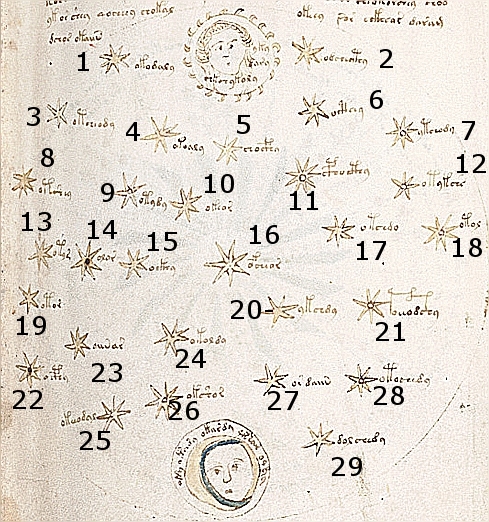 f1r provides a detailed description of the figures associated with the 30 degrees of the sign of Taurus and f1v illustrates the 30 figures, with a layout similar to that of the Voynich zodiac pages. The name of Taurus (here “tauro”) appears at the beginning of f1r and bulls (“toros” or “thoros”) are mentioned in the descriptions of several individual degrees in both pages. On the basis of this analogy, it is reasonable to expect that Taurus and maybe bulls are also mentioned in Voynich f71v and f72r1 (the two Taurus pages). 2) The label EVA:otochedy only appears as a star label in f68r1 (star #28, according to Stephen’s numbering) and immediately after a “start marker” in the circular text surrounding the Cancer page f72r3. I don’t know of any proposed interpretation for this label that accounts for both occurrences, but this Voynichese word also seems to suggest that the zodiac pages are related with stars. Visual and textual evidence, internal and external to the VMS, suggests that your observation is highly relevant: we should expect the names of the zodiac signs to be appear in the zodiac pages. If EVA:doary denotes “Taurus” why can’t the label be found in the two Taurus pages? A possible explanation is lexical variation. As I wrote above, in Lat 1283.a three different words meaning “bull” are used: “tauro”, “toro” and “thoro”. The last two also appear in plural forms: toros and thoros. This example is not particularly informative and its interest is mainly its appearance in a page that is well known to Voynich researchers. Sol, sol, Solhelh, solelh, solhelh, solhel, so–lelh. At the light of this, a possible candidate match for EVA:doary in the Taurus pages is EVA:dar, that according to Stephen’s (and Derek’s) phonetic system could read something like “twr” or “tur”. The word is close to the Arabic “thaur” and other similar forms discussed by Stephen in his 2014 paper; one could also mention the Russian тур (tur) for “aurochs”. An obvious problem is that the EVA:dar is too frequent to only mean “bull” (it appears in all the sections of the manuscript, with a total of 319 occurrences). If EVA:dar means “Taurus” it must likely have other unrelated meanings as well. All this is still speculative. Being able to systematically find the kind of internal links you suggest, or to coherently interpret one of the “structured data-sets” that have often been discussed on this pages, in particular by Darren Worley, would be a huge step forward. Hello, and thank you for your comments – absolutely no need to apologise for anything at all! I am happy for people to discuss any ideas, here or on other forums, and express their views, positive or negative. All languages borrow from others, and sometimes the words they borrow are kept more or less without alteration, and sometimes they can receive inflections and alterations, and sometimes they even become in a way part of the language which has borrowed them. To my mind many of the words I tentatively identified in my original paper could be borrowings of various sorts. ‘Taurus’ is a good example (though it is important to note that others long before me had suggested Taurus for that label) and so is ‘Centaurun’. They could be borrowings into Voynichese. However, we might imagine that elsewhere in the manuscript, for example in the zodiac pages, the writer uses the word Taurus but adds a grammatical element at the front or back or even in the middle (an infix) which would make it difficult for us to identify. Or else s/he might use a synonym from his own language such as ‘the bull’. At this stage we simply don’t know. That is what Marco was saying in his mention of lexical variation. Secondly, when you talk about things like ‘simple substitution’ I feel you are making things more complex than they need to be. My idea is that this is a language written in a new script, but we just need to work to find out how it was encoded. I don’t follow the ideas of others who try to see complex codes in it at various levels. Even the way the manuscript is written makes it look to me like a natural handbook written for a group people as a record; I don’t see any hints at deliberate secrecy. So I am not saying that some words (e.g. labels) are ‘encoded with a simple substitution’ and others are not. I am saying that we are possibly dealing with a natural language, but we haven’t yet found out what it is. If the line is supposed to be Draco then Ursa Minor is also an option – also markinf the north – though perhaps positionally Ursa Major remains more plausible as mentioned in the article.